Divide and rule! This was the mantra adopted by the British to break India. To break the very backbone of her existence so that Indians remain backward and never get united to fight for a common cause. It was a series of freedom movements across the length and breadth of the country that gave the British sleepless nights. And the War of Independence of 1857 further dampened their spirits. It was then that the British decided that creating wide cleavages in the society by dividing the people on the basis of caste and religion can go a long way in breaking the very base of the country. They felt following this ‘divide and rule’ tactic they could weaken any mobilisation of the Indians against their rule. And they succeeded in it! They implemented it and found it to be favourable for the growth of the British Empire and its smooth functioning. Indica is the book written by Megasthenes, the Greek ambassador to India around 300 BC. Megasthenes spoke volume, hailing praises on the cultural, social and administrative system which prevailed in India during that time, as seen by him. According to this book, there was no caste system in India, but categorization of profession/work into seven types. This categorization of work was depicted as ‘caste’ in Indica. The book dispels caste theories that is plaguing India at present. Even the Vedas find no mention of caste, but ‘Varnas’, categorizing people on the basis of work. When ancient scriptures and historical records prove the absence of caste system in ancient and medieval India, which was further corroborated by foreign historians, why is India burdened to her core by a social disease introduced by the British? 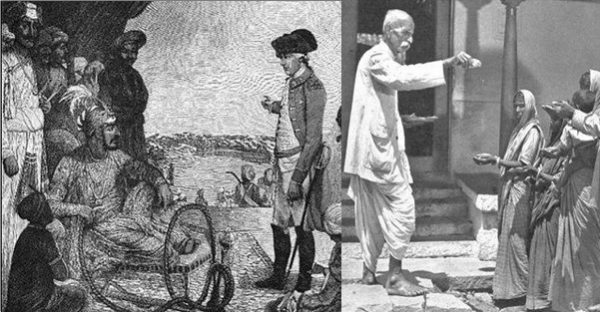 After the major war of independence in 1857 that spread across the length and breadth of India, shaking the British Empire, caste and religion were the weapons chosen to divide and break India. 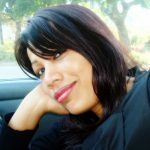 They used Indians against Indians on the basis of caste, kingdom hood, and religion to firmly establish their supremacy. 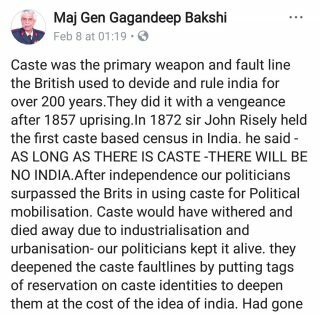 This ‘divide and rule’ policy of the British on the basis of caste and religion triggered the existence of various caste conflicts in the Indian society. The British left India. But their policy, now ingrained deep in the Indian society, continue to further break India. The seeds they have sown have yielded into big trees and bearing the fruits! The fruits breaking the country’s very backbone! It is time the sons and daughters of the soil rub their eyes to draw example from our rich past where no caste system existed. It is time India awakes from her deep slumber before it is already too late. Jai Hind! 2. Caste Confusion and Census Enumeration in Colonial India, 1871-1921, Michael Haan.